An Obama-appointed, pro-corporate judge in Texas has put the brakes on the Department of Labor’s overtime rule that was set to go into effect on December 1st. By kicking the can down the road, he’s giving Trump the chance to completely scrap the rule once he takes office. The Ring of Fire’s Farron Cousins discusses this. 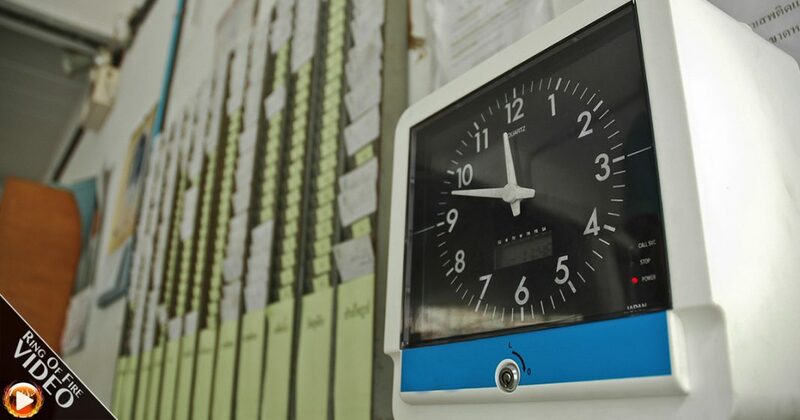 A judge in Texas, a judge appointed by President Obama, has decided to effectively put the brakes on an overtime rule from the Labor Department that would have extended overtime pay to employees making up to $46,000 a year. The previous threshold for that was $23,000 a year for salaried workers. If they made anything over that, they weren’t entitled to overtime. The new rule said anybody making $46,000 or under, essentially doubling the threshold, was entitled to overtime pay from their employers. This judge in Texas, Judge Amos Mazzant, basically says that – Look, given the fact that this rule is supposed to go into effect December 1st, tomorrow, we can’t really render a credible verdict on this. We don’t quite know if it’s legal for the Labor Department to do this. We just need a lot more time to think, therefore you have to stop the rule from going into effect right now. We’ll kick it down the road a couple of months. We’ll get you an answer. Yeah. You know what happens in a month and a half? Donald Trump becomes the next President of the United States. Do you know what Donald Trump is going to do to this rule? He’s going to throw it away. He’s going to get rid of it. This rule, because of this judge that President Obama himself appointed, will never see the light of day. Tomorrow, millions of American workers were going to start getting overtime pay. Tomorrow. Now they don’t. Millions of workers knew this was coming. Right before the holidays, too. Hell, what a great time to have a little bit of extra cash in your pocket. Now they don’t. It’s because of a judge that President Obama appointed himself. This judge screwed over the man who appointed him, and the saddest part is, it was entirely predictable. The same thing we have seen with almost every single judge appointed by President Obama applies to Judge Amos Mazzant, and that is that he came from a corporate defense law firm where he worked with companies to try to prevent them from having to pay out employee claims. The law firm that this man, Amos Mazzant, came from represented Halliburton. They represent insurance companies trying to prevent them from having to pay out claims. That’s the kind of person that President Obama appointed to this bench. It’s the same kind of person who always sides with corporations because they’re the ones who have paid his bills for so long. We have seen this time and time again. That’s what Eric Holder was. That’s what Loretta Lynch is, and that’s what this Amos Mazzant character is. President Obama continues to pull judges and legal experts from corporate defense law firms. People who have made millions of dollars by screwing over consumers and helping already rich corporations. That’s what we’ve gotten from Obama, and that’s one of the main reasons why the Democrats got such a beating this year. Obama can’t help himself from appointing these corporate hacks into positions of power on the federal bench. Millions of people were about to get overtime pay tomorrow, and because Obama can’t stop picking attorneys and judges from corporate defense law firms, they won’t get that overtime now. We can blame Amos Mazzant all we want. The real fault here does lie with President Obama, because he should have known what happens when you pick a man who worked at a law firm that made hundreds of millions of dollars representing the scum of this country, because that’s what they are. Insurance companies that don’t want to pay out, when you get injured in an auto accident, or you have a health insurance claim, or a home insurance claim. They are scum. Halliburton, scum. This guy had no problem representing those people, or maybe he never even went to court. He damn sure worked for people who went to court to fight for these people, made millions of dollars from it. He got some of that money. That’s pathetic. President Obama has screwed himself over time and time again during his administration. You want to feel bad for him because we know what’s coming around the corner with Donald Trump and how horrible things are going to be, but all of President Obama’s failures, including this one with the overtime rule that’s been effectively stopped by Amos Mazzant, it’s all his fault.